I’ve given the standard Libby recipe more spices, and made it more interesting. 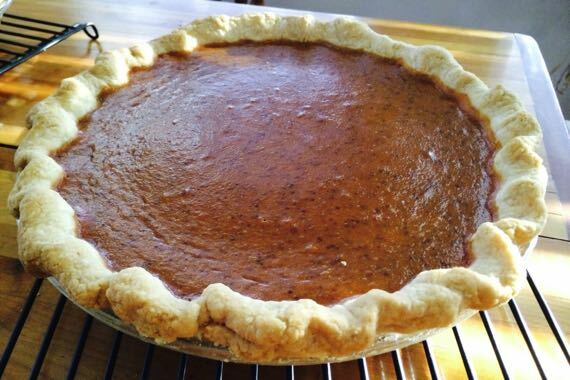 This recipe uses the large, 29–ounce can of pumpkin*, two cans of evaporated milk (12 oz. each), and makes two pies. Put four eggs on the counter to come to room temperature. Make pie crusts and fit into 9-inch pie pans (I use glass). My favorite recipe means making the dough ball at least four hours before rolling it out, with overnight preferred. The texture is just better. Turn on oven to preheat to 425°F. 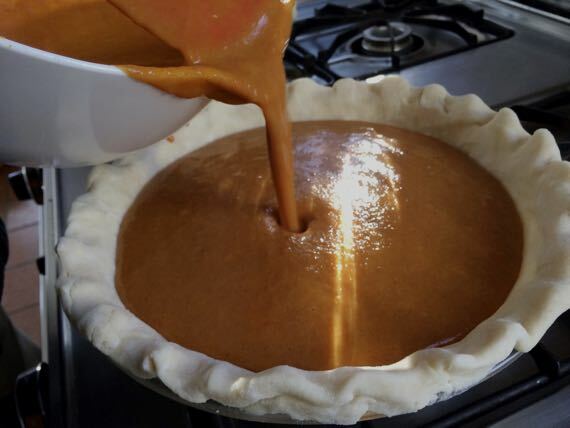 With crusts waiting in pie pans, start the pie filling by mixing the dry ingredients in a smallish bowl. In a large mixing bowl, begin the pie filling mixture. Begin by beating the four eggs until they become lighter in color and frothy. Add the pumpkin in two or three batches, blending together in between. A metal whip works well for this. Add 1–2 tablespoons molasses. Blend. Can be added with last batch of pumpkin. Now stir in the spice mixture. Can be added in two batches. Stir in the two cans of evaporated milk (12 oz. each), probably two batches for the first can, then all of it for the second can. Bake in preheated 425°F oven for 15 minutes. Then, turn down the oven to 350°F, and bake about 45–50 minutes until the filling no longer jiggles or almost doesn’t jiggle. Cool on rack for two hours, then serve. NOTE: with glass pie pans, reduce temperature in each case by 25°F, to 400°F for the initial bake, then 325°F for the final baking. * NOT the product labeled “pumpkin pie filling”—just the plain pureed vegetable. You can make your own, of course.